Quantaray Shoe Mount Flash. I have tested it and it is in working order. With a high guide number of 65 (ISO 100/feet), the XLF-50 can provide superior illumination in any situation. The Quantaray by Sunpak XLF-50 is compatible with the latest Nikon i-TTL TTL flash technology for seamless integration for ease of use. Quantaray Digital CN Module For Canon E-TTL ll. Condition is New. Shipped with USPS Priority Mail. Quantaray Dedicated Flash Module For Nikon AF (autofocus). Condition is New. Shipped with USPS First Class Package. 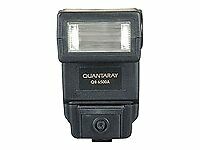 Quantaray QB-6500A Flash 5315020. For sale is Quantaray flash. It mas ML module. BeU Thrifters are selling a Quantaray PZ-1 DSZ Electronic Flash. The flash is: - Quantaray PZ-1 DSZ electronic flash. - Dual swivel Zoom. - Monitored power Zoom. - Swivel & Bounce head - Main and fill in flash - ISO 100. Guide number 75-138. - The flash is new in the box. The box isn't totally perfect. The flash is in perfect condition. Still in bubble wrap. - We accept returns. We refund the funds once the item is returned in the identical condition it was shipped in. Thank you! * We welcome offers. Please understand that shipping is included for most items and keep that in mind when making offers. We cannot accept offers less than the shipping costs. Thank you for you purchase. Quantaray QB-6500A Shoe Mount Flash. Condition is Used. Shipped with USPS Priority Mail. Tested, works. Quantaray QAF 6600 Zoom bounce flash. 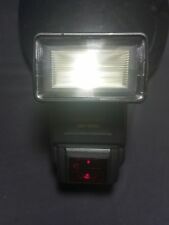 Prinz Tri-Lite Flash. Vesta SP 700 Flash. Honeywell Model 330 Flash. In VERY GOOD USED condition. Includes Original Box, Instructions and Dedicated Module. This flash is in excellent condition. Has test button and shoe lock. Quantaray Digital NK Module For Nikon. Condition is New. Shipped with USPS Priority Mail. Very nice condition and working order. tested, flash works great. Lightly used if used at all. Tested with batteries & fires with flash (Batteries not included). Rear screen light up when powered as intended. 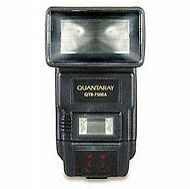 Quantaray AF 6600 flash. For sale is used Quantarau AF 6600 Nikon dedicated flash. This flash is used, but it looks and works good. Flash shows n ormal signs of use. It has couple minor nicks and scratches on exterior. Crisp and clean. Working condition. Smoke and pet odor free. We are a family owned antiques appraisal and consulting service located in Christiansburg, Virginia. We do not share your information with any third parties. Listed as used because the box was opened. Scotch taped IR cover as it is no longer permanently attached. Quantaray QAF 6600 Shoe Mount Flash. This item is in used condition. If you have any questions please ask seller. Shipping will be Free. New in box. Includes instructions. Quantaray QTB 9500 Hi-power flash for Nikon. Quantaray QB-6500A Shoe Mount Flash. Condition is Used. Shipped with USPS Priority Mail. Quantaray QTB-9500A Hi-Power Twin Auto. Flash Shoe Mount Flash w/ QPH-5000 Handle. Good condition,Has minor wear and scratches. Quantaray QB-6500A Flash Only. New In Box. 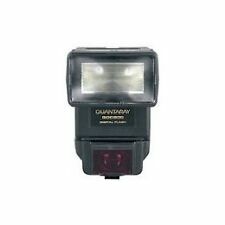 Quantaray QB-6500A Flash Condition is New. Opened item to inspect and for pictures. 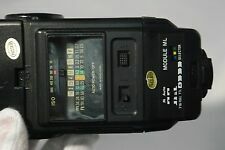 IT DOES NOT INCLUDE THE MOUNT TO CAMERA CONNECTION ONLY FLASH MECHANISM WHAT YOU SEE IN YHE PICTURES IS WHAT YOU WILL RECEIVE. PLEASE SEE PICTURES. Thank you. The Quantaray PZ-1 DSZ Series TTL Power Zoom Flash is made for us by Sunpak, so you can be confident of the quality. You?ll find a bounce head for professional results, a choice of front or rear curtain synchronization, a choice of several power sources and an Auto-off to save on battery power. There are two flash tubes - the smaller secondary flash is on the base of the flash and can be turned on or off as needed - it is useful for filling in shadows created when the main flash head is used in bounce flash settings. QA-25 Computerized Automatic Flash. with Lens Cleaning Kit. Shoe Mount. Presenting a very clean (except a crack on top right hand corner, see photos) Quantaray QTB5000AF shoe mount dual flash. Flash works flawlessly and has been tested with various cameras. Battery compartment is free of corrosion and requires 4 x AA batteries (not included). This flash unit has been tested and is in excellent working condition. Dedicated flashes. The QBX 8000xi dedicated flash is fully linked to all the operations of your. The QBX 8000xi features TTL exposure operation, a manual zoom head, a focus assist beam. 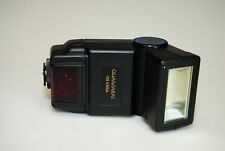 Used Quantaray QBX-8000xi Flash. PALLET SHELF BOX K-20 KH.